Beta compares the change in a stock's price with the market, while implied volatility forecasts the future performance of a stock price. 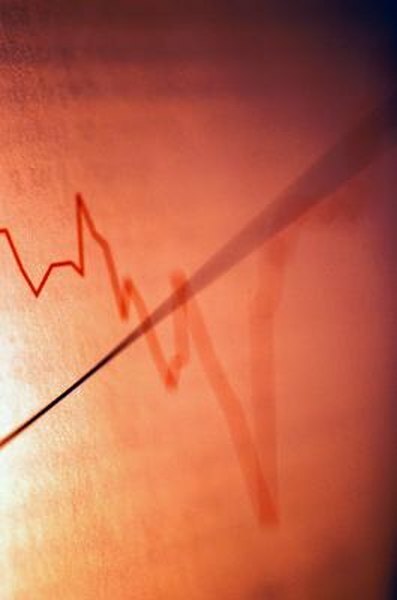 Volatility is a financial measurement that tells investors the degree to which a stock's price changes. Stocks with low volatility are stable, usually larger, blue-chip companies, while high-volatility stocks fluctuate in price and can be risky and rewarding for investors. Implied volatility and beta both describe aspects of a stock's volatility. Implied volatility measures investor sentiment about the future performance of a stock, while beta compares a stock price's changes against the rest of the market to give perspective on the stock's performance. Online brokerages and free financial news sites provide information on a stock's beta and implied volatility measurements. Beta is the measurement of a stock's returns when compared with all the other stocks in a market. Beta is a historical measurement and is usually measured against a stock index, commonly the S&P 500 index. The ratio is expressed as a decimal. If a stock has a beta of 1.0, it means the price rose or fell at the same rate as the market. It is most often used by options traders to gauge how much a stock will rise or fall. For example, a stock with a beta of 2.0 grows at 20 percent during a period of time where the S&P 500 only grew 10 percent. Implied volatility is a measurement of how much the market believes a stock price will change in the future. It is primarily used by options traders to help judge the fair price of an option, which investors use to speculate on the future prices of stocks or to add protection to their portfolio by "hedging" their investments. An option is a contract between investors to buy shares of stock at a certain "strike" price at a future "expiration" date. Investors trade these option contracts for a price called a "premium" that is negotiated between the "ask" and "bid" price. Because these contracts are open, the true value isn't yet known, and investors use implied volatility to help set a price for options. Implied volatility is expressed as a percentage, is usually measured at an annual rate and tells investors what the market expects to happen to the stock price. While implied volatility measures a stock's anticipated changes, it doesn't forecast whether that stock's price will rise or fall, only by how much it will move. For example, a $10 stock with an implied volatility of 20 percent is expected to see it's price change by $2 over the course of a year to either reach $12 or fall to $8. Investors can also track implied volatility for the market by following the Chicago Board of Exchange's volatility index, or VIX. By measuring the 30-day implied volatility of all the stocks in the S&P 500, the VIX measures investor sentiment and is sometimes called the "fear" index. According to Scottrade, a VIX of below 20 is low, which shows a stable market where investors are more likely to buy stocks. A high VIX level of 25 or above means investors could spark a sell-off. NobleTrading: What Is Beta Value of Stocks? The Options Playbook: What is Volatility? What Is an Abnormal Rate of Return in the Stock Market?